Stuart Dallas rises for a header. Leeds United are expected to confirm the signing of Brentford winger Stuart Dallas today after a minor delay in sealing the deal. Dallas was poised to join United on a three-year contract after completing a medical yesterday, but the transfer was temporarily put on hold due to power-line work which closed Brentford’s Griffin Park stadium. Leeds and Brentford have already agreed a £1.3m fee for Dallas and the 24-year-old Northern Ireland international finalised the terms of his contract at Elland Road last week. He returned to Northern Ireland for a family funeral over the weekend but arrived in Yorkshire yesterday to undergo a medical. Dallas, who played 38 times and scored six goals for Brentford in the Championship last season, is poised to become Uwe Rosler’s seventh signing of the summer. Rosler took Dallas to Brentford from Irish club Crusaders in 2012 and is preparing to land him for a second time later today. 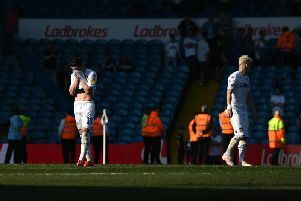 United’s head coach indicated on Saturday that Dallas could be the last major signing in this window, through sources at Elland Road say owner Massimo Cellino – back in England today after a break in Sardinia – could yet finance a further arrival. Rosler said: “I think in terms of permanent deals, when that (the Dallas transfer) goes ahead we are done. “Obviously there’s the loan market which could also be attractive under certain circumstances. “Today we had a squad of 18 who I regard as outfield players. “That’s not the biggest squad in the world so we always have to have our eyes open,” said Rosler. Dallas’ arrival will effectively complete Rosler’s line-up and the winger is in line to make his debut in Saturday’s Championship opener against Burnley at Elland Road.